Welcome to the ultimate guide on how to use a fish finder to catch bass, crappies, or any other kind of fish. Since you’ve made it to this page, we are going to assume that you already own or have recently purchased a fishfinder. The good news is that most of today’s fishfinders work pretty well right out of the box. The great news is that with a little fine tuning and practice, you can learn how to use a fish finder to catch bass, crappies, and other fish, along with locating structure, like a pro. Simply follow our step by step guide below to get your fish finder and transducer installed, properly setup, and learn how to read the screen to effectively locate structure using your fish finder. 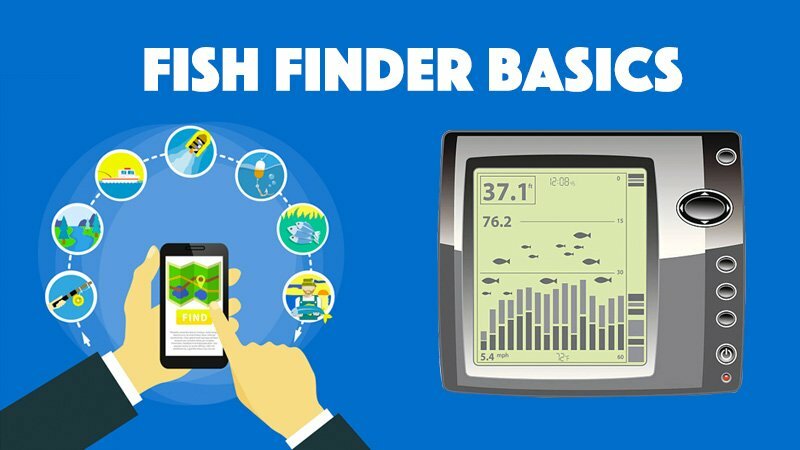 The first step in learning how to use a fishfinder is finding the best location on your boat to mount it. In most boats, the best location to mount a fish finder is on the helm or dashboard area. The helm typically provides the best viewing angle, as well as the best access to the depth finder. You don’t want to install the fish finder so that it hangs down from an overhead top, nor in an electronics box. Both of those places make it difficult to see the fishfinder. It is also ideal to install the fish finder where it can be swiveled without making contact with anything, such as a throttle or windshield. After you have located the perfect mounting spot, it’s time to mount the fish finder. For this step, it’s best to consult the instruction manual that came with your unit. However, most depth finders mount to the boat using either one or two screws. If your helm doesn’t have any existing holes, you will need to carefully drill the hole(s) for the mounting screw(s), along with a hole for the wires. After you have the holes drilled and the fish finder mounted, we recommend that you place a bead of silicone around the holes, to prevent any water leaking under the helm area. Next up is mounting the fish finder transducer onto the boat. This too requires locating the perfect spot for mounting. Look for an area on the back of the boat that will allow you to mount the fishfinder transducer as deep as possible. Make sure that there is nothing in front of it that could interrupt the water flow below it. Any type of turbulence in this area will negatively affect the fishfinder’s performance. After having found the perfect location to mount the transducer to the boat, it’s time run the transducer’s wire to the helm, where the fish finder is located. This should always be done prior to actually mounting the transducer. Pro tip: Instead of cutting any excess transducer wire, simply wind it up and secure it under the helm. Cutting the wire will only cause you problems with the connections. Also, in order to avoid any interference with the fish finder unit, avoid running the wire along any other wires, such as a VHF cable. Finally, following your fish finder’s instruction manual, securely fasten the transducer to the boat. If your unit came with any type of sealant, make sure that you follow the directions exactly. The last thing you want is a leak in your boat. If this is your first time learning how to use a fishfinder or installing a fish finder, you may want to get the help of another fishing buddy for this step. Many people ask us how to use a fish finder to catch bass or crappie on a canoe or kayak. 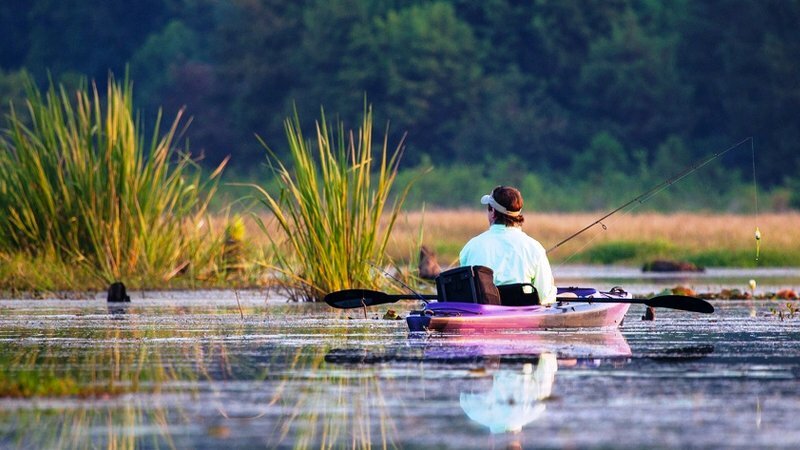 Our answer, simply enough, is to mount a fish finder on a canoe or kayak. There are various ways in which this can be done, and it all depends on your specific canoe or kayak. Most of the kayak and canoe setups that we see have the fish finder and transducer mounted to a board. This type of setup makes it convenient to remove the depth finder on those days when you want to leave it at home. As you can see from these two setups, you can get a bit creative with how to mount a fish finder on a kayak or canoe. No matter how you decide to mount a fish finder on your kayak or canoe, you are going to need a power source. We recommend picking up a 7 or 8 amp, 12-volt battery. They are compact, relatively inexpensive, and will power your fish finder all day long. In addition to the board mounting option, some fishermen, like in the video below, go for a more permanent means of mounting a fish finder to the kayak. Like a lot of modern electronics, most fish finders will work great out of the box. For this reason, we advise that for most people’s fish finder setup, that they leave the default factory settings for most items. We are firm believers that simple is better. If you try to get too fancy with your fish finder setup, you could actually do more harm than good. Much like a brand new digital camera, it will work great out of the package for most people, therefore they should just leave it be. This is especially true if you are just learning how to use a fishfinder. That being said, there may be certain situations when you will want to adjust your fishfinder setup. For example, if it’s a particularly choppy day out on the water, you may want to turn down the device’s sensitivity, in order to reduce false signals. Or, you may want to adjust the screen brightness, depending upon the light conditions on a given day. These sorts of simple fish finder setup options are usually quite simple to do and have a low risk of you messing something up and making your fish finder less effective. As with any electronic device, it’s best to consult the user manual on how to adjust those settings during your fish finder setup. Now that you have your fishfinder installed and the settings dialed in, it’s time to learn how to read the fish finder screen. Most devices today feature many of the same data points, such as boat speed, water depth, and water temperature. It’s the features that go beyond that, along with how that data is displayed on the screen, that set one unit apart from another. For example, some fishfinders also have built-in GPS, which allows you to see your boat’s position right on the fish finder screen. Others will have a compass option available on the fishfinder screen. These more advanced features are naturally reserved for the more expensive devices. How you read a fish finder screen really depends on which model that you have. Some really cheap fish finders have a gray-scale screen, which can make it difficult to read the fish finder screen. While the cheaper devices will give you a general idea of what type of surface is on the lake bottom, it will be almost impossible to clearly tell a rock from a tree stump, for example. Some of the newer, more pricey depth finder models have color screens and feature DownScan Imaging, or DSI for short. Some manufacturers refer to this feature as Down Imaging. As the name implies, Down Imaging is the fishfinder’s ability to provide crisp, near photo-like images on the screen of the structures and bottom that is below your boat. The crisp, clear images are displayed on the fish finder screen using special Down Imaging software which interprets the unit’s returning Sonar signal much more vividly than devices without DSI. DSI technology makes it easier to read the fish finder screen. We found this short video showing you how to read a fish finder screen with DSI technology. Each model may vary slightly, but this should give you a good overall idea on how to read a fishfinder screen. For any fisherman, locating structure with a fish finder is an invaluable skill. When referring to structure under water, we are referring to things like humps, bumps, drop-offs, slopes, and ledges. Fish use structure sort of like how we use highways to get around. They follow the contour of the water bottom, in order to stay out of the wide open expanse of the water, where they can more easily become prey for a larger predator fish. It is important not to confuse structure with cover. Cover are things like rocks, sticks, weeds, or stumps. Cover provides temporary refuge to fish, but it is not their main means of navigating through the water. Ideally, you would like to locate structure with a depth finder in an area that also provides cover. This is where you will find the most fish. Locating structure with a fishfinder is not that difficult on smaller lakes, as it’s easier to cover a smaller area with your boat. However, for larger bodies of water, this can prove challenging. Luckily, some devices make finding structure with a fish finder quite easy by using pre-loaded maps that show waypoints on the screen. Some of these maps you will need to purchase, while others you may be able to find online for free. We cannot stress enough how nice it is to have a pre-loaded map on your unit, and how easy it makes it to locate structure with a fish finder. Now that you have your fishfinder installed, properly setup, and you understand how to read the screen, it’s to put it to use by learning how to use a fish finder to catch bass, crappie, and other fish like a pro. Follow our fish finders tips for catching bass below, and you are sure to have more success the next time that you are out on the water. Tip #1: Seek out shallow, warm water, using your fishfinder’s temperature and depth gauges. This is particularly important in the spring, when bass and crappie will be clustered in warmer water. Tip #2: As you are first pulling away from shore, monitor your fish finder for any cover or structure, such as weedlines or drop-offs. As we mentioned earlier, areas with both structure and cover will typically contain the most fish. Tip #3: Focus primarily on locating structure with your fish finder. Keep an eye on the depth finder screen and watch the bottom of the surface for any irregularities. That’s where the most bass will tend to be hanging out. Learn how to plot these points on your fishfinder, so that you can circle back to them in the future. Tip #4: When you do locate some structure, check the fishfinder screen for fish activity. Obviously, if you spot any single fish or small schools of baitfish, that’s a great sign. 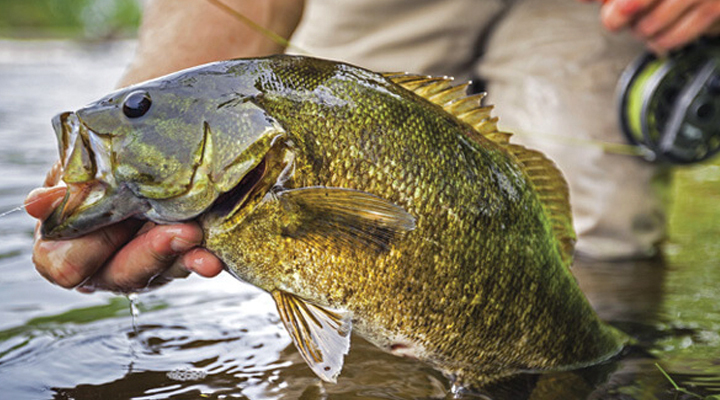 The fish you spot may or may not be bass, but the only way to tell is to start fishing. We recommend starting out with deep-diving, quick moving crankbaits, to try to draw any bites. Tip #5: Look for reefs or humps that are located in deeper water, as the fish located here will have less competition from other fishermen, thus making them potentially more willing to bite. it can be difficult to find such areas without a map. Therefore, as we mentioned above, using a fishfinder with a pre-loaded map would give you a huge advantage. Throw your favorite baits around this area for a while to see if you can stir up any bass or crappie. Remember to keep an eye on the depth finder screen for any fish activity. Tip #6: When you do locate structure with your fish finder, drive your boat over them in a zigzag pattern, while keeping watch on the fishfinder screen, looking for other unique structure. The zigzag pattern will allow you to most effectively cover and plot the area. Even if you don’t find fish the first time, chart the spot on your device as a waypoint to visit again later, or perhaps on another day. 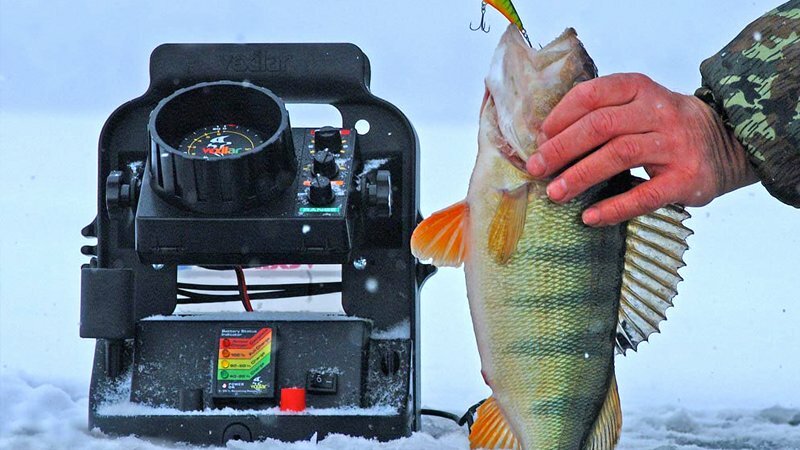 If you have read the entire article, you should now have the know how to use a fish finder to catch bass, crappie, or just about any other fish. Learning how to use a fishfinder most effectively is not difficult, but just like anything else, it takes a little bit of practice.